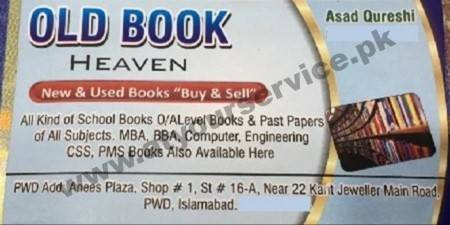 Old Book Heaven is located in Anees Plaza, Main Double Road, PWD, Islamabad. We sell a large variety of new and old book on all subjects. We deal with all kind of school books, O/A Level, past papers of all subjects. Books are available for MBA, BBA, Engineering, Computers, CSS, PMS, Novels, FictiOn, General Books, Children Books, Urdu Literature, Islamic Books, Entry Test Books, and much more. Just call us to find the availability status of the books you are looking for.